On Friday night, Jan. 11, the varsity wrestling team hosted Mill Springs Academy, GAC and Westminster in the Inman Center. This was the final home meet of the season and the last home meet for seniors Ahsan Hennings, Chilton Tolliver and Charlie Warren. The seniors led the way with a combined 8 – 0. Freshmen George Blaha and junior Grant LeRoux each won three matches on the evening. Freshmen Edward Blaha, Sam Howe, Jack Warren and junior Connor Husk each won two matches, while freshmen Jude Black and Henry Leusink each won one match. The Knights beat Mill Springs and GAC but lost a close one to Westminster. 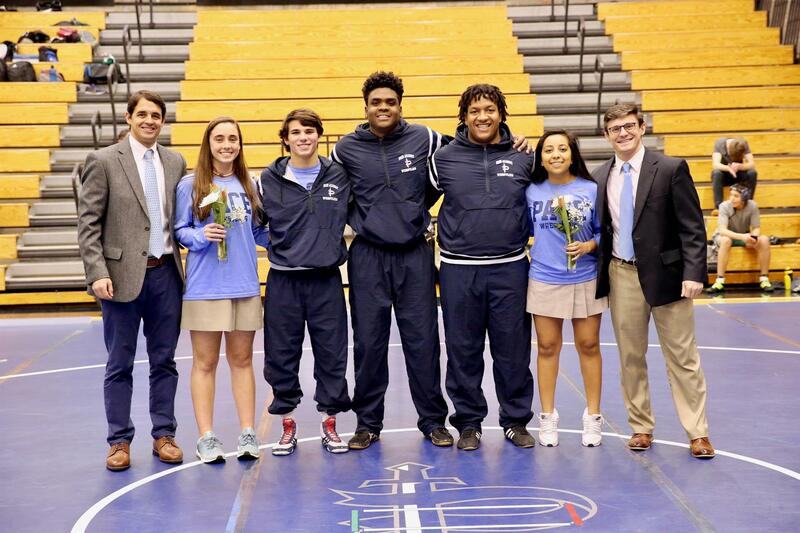 The Knights will compete again on Wednesday, Jan. 23, at 5 p.m. at Wesleyan against Wesleyan and Cambridge in the final dual matches of the season, and then again on Saturday, Jan. 26, at 8:30 a.m. at the Darlington School in the final tournament of the regular season. The AquaKnights hosted Woodward Academy on Thursday, Jan. 17. The boys came away with a close win, while the girls fell to a strong opponent. There were 33 personal-best performances, four lowered state-qualifying times, and a new school and pool record. Sophomore diver Lizzy Kaye set new school and pool six-dive records, beating her own previous Pace records by almost 20 points. 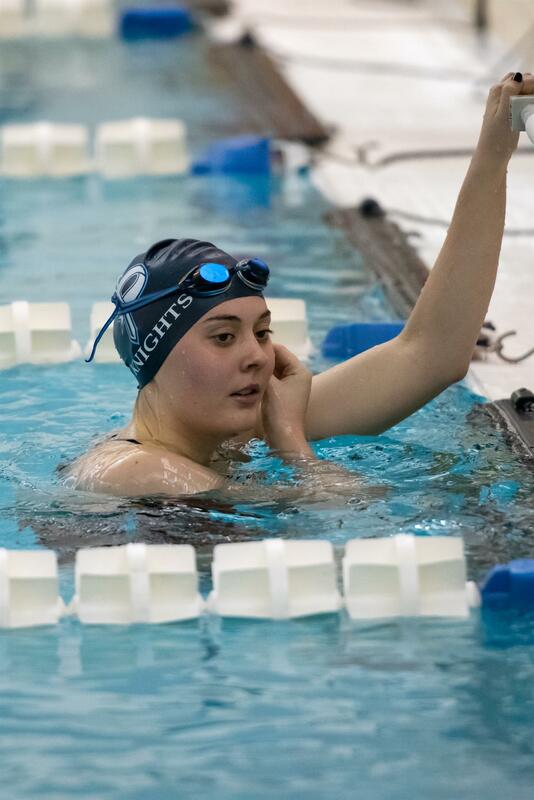 Senior Charlie Kaye lowered his state-qualifying times with wins in both the 200 free and the 100 free, and junior Erin Hood lowered her state-qualifying times with wins in the 200 IM and the 100 butterfly. Other top Pace finishes included the girls medley relay of Hood, Kaye, junior Meghan McMillin and sophomore Amalie Little, which finished in first place with a lowered state-qualifying time. Senior Luisa Whitney swept her events with wins in both the 200 free and the 100 breaststroke. McMillin also swept her events, winning the 50 free and the 500 free. The girls 200 free relay of Hood, McMillin, Kaye and Little also came in on top. The AquaKnights will compete next at the Last Chance Invitational Diving and Swimming meets on Jan. 25 and 26 at Pace. Coming off a hard-fought victory over Lovett, the varsity girls basketball team headed into the week with another formidable opponent. Stone Mountain, tied for second in the region (5-2), entered the game averaging over 60 points per game in region play. Once again, the Knights' defense was relentless, allowing just 5 points in the first quarter, while senior Ann Rafeedie sank three 3-pointers from deep to get the Knights off to a quick start. The Pirates answered with a second-quarter run and cut the lead to 7; Pace went into halftime ahead 26-19. Pace emerged from the locker room on fire, with two 3-pointers from junior Jordan Upchurch, and 3-pointers from Rafeedie and senior Madeline Janki. 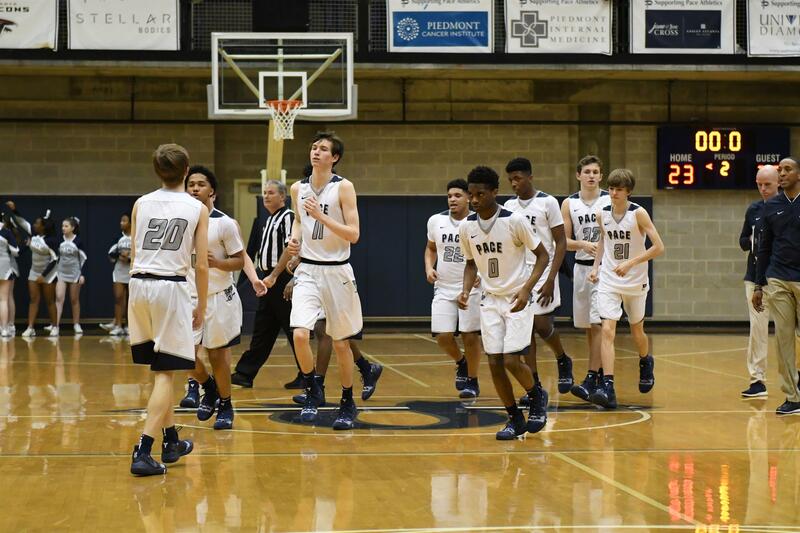 With a final score of 52-27, Pace held Stone Mountain to 34 points below their season average in region play. Sophomore Camryn Jones led the way on the boards, snagging 11 rebounds. Senior Joelle Zelony controlled the pace of the game and dished out eight assists to go along with 11 points and six rebounds. Rafeedie led all scorers with 20 points, five rebounds and two assists. On Saturday, Jan. 19, the Knights took on non-region opponent North Springs High School. The press proved to be overwhelming early in the game, and North Springs was held to 9 points in the first half. 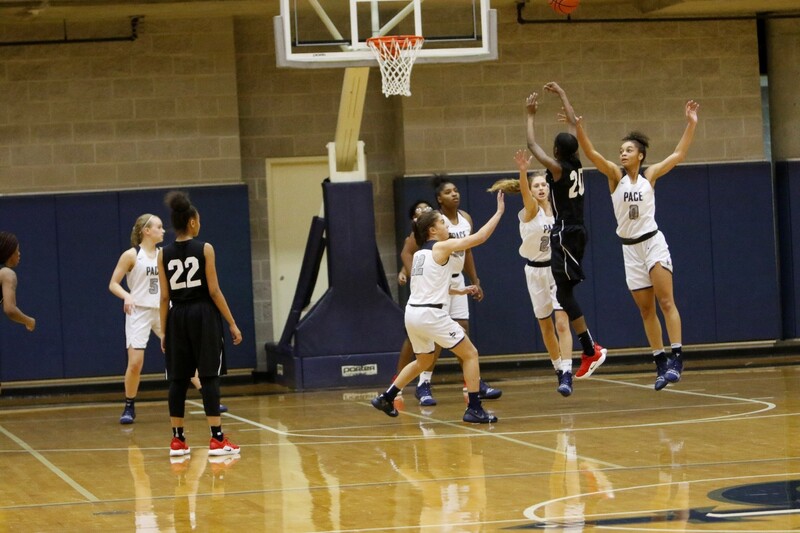 Collectively, the Knights amassed 32 steals – senior Kayla Ross and Rafeedie both finished with six steals each; junior Virginia Hobbs and Janki had five; Jones had four; senior Paige Fleming had three; Upchurch had two; and junior Taylor Doucet had one. Ross led all scorers with 16 points and five rebounds. Hobbs finished with 14, followed by Rafeedie with 10 points and five rebounds. Janki and Jones both finished with 7 points; Upchurch had 5; and sophomore Hanna Vincent chipped in four. The final score was 63-15. On Tuesday, Jan. 15, the varsity boys basketball team faced a short-staffed Stone Mountain team at home in front of a decent-sized Pace student section. The Knights emerged too much for Stone Mountain to handle, winning the game 66-36. The Knights were led in every major category by junior Reign Watkins, who finished with 15 points, shooting 7-13 from the field. Watkins also dished out five assists on the night. Senior Myles Todd also contributed to the effort, scoring 12 points and shooting 2-3 from behind the arc. On Saturday, Jan. 19, the Knights returned to the Inman Center to face North Springs High School and won the game 57-25. The Knights scored 25 of their 57 points by capitalizing on North Springs' turnovers. Watkins led the Knights' scoring effort, scoring 15 points for the second straight game and swiping four steals. The Knights were also solid on the fast break, scoring 20 points in transition. On the MLK Holiday, the Knights traveled to Dayton, Ohio, to take part in the "Flyin' To the Hoop Tournament," where they squared off against Ohio's Thurgood Marshall High School. The Knights put up a true fight, holding Thurgood Marshall to only 35 percent from behind the arc, but unfortunately lost a close game 64-56. The Knights received a strong output from sophomore Madison Durr, who scored 16 points and grabbed six rebounds. The Knights were also strong on the glass offensively, scoring 13 second-chance points. The Knights flew back to Atlanta on Monday night and were on the road to face Towers High School on Tuesday, Jan. 22, in a game where they emerged victorious 61-47. Durr had his strongest games of the season, scoring 19 points and shooting 8-11 from the field. Junior George Adams also contributed to the Knights' winning effort, knocking down a 3-pointer and taking three of the team's five charges. The Knights have a tough matchup this Friday, Jan. 25, when the Westminster Wildcats travel up West Paces Ferry to the Inman Center. Friday is Senior Night—join the Knights as they celebrate their lone senior, Myles Todd.